SOLD OUT. 2 LIVE PLANTS. This vigorous bush has leaves that are a reddish-purple color in full sun, making a striking specimen plant or border plant! When not in bloom, passersby often think they are Japanese Maple. 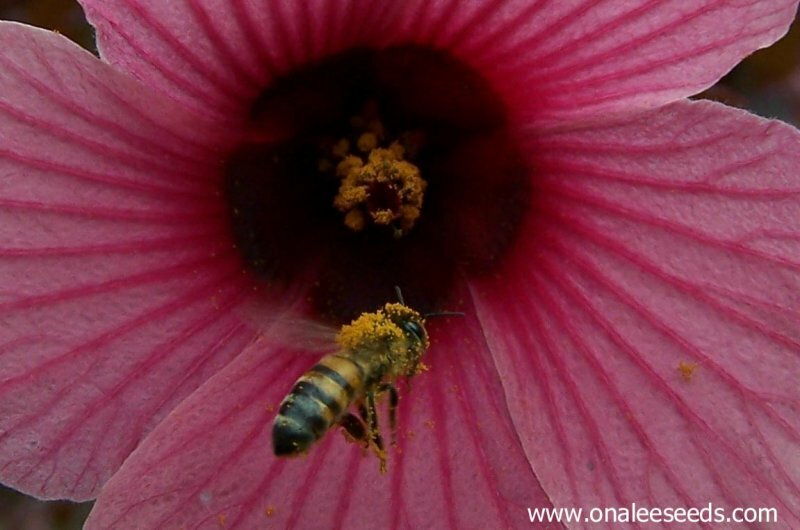 The flowers are a beautiful light pink with dark pink veins. The plants you are buying are from 6 - 12 tall. They will have most, or all of their leaves trimmed off for shipping, but will re-bud once established at their new home. These will be shipped via Priority Mail, bare root and will need to be planted, either in containers or in the garden, immediately upon receipt. This vigorous bush has leaves that are a reddish-purple color in full sun, making a striking specimen plant or border plant! In the shade, the leaves are a deep green with reddish-purple veins. When not in bloom, passersby often think they are Japanese Maple. To top it off, the flowers are a beautiful light pink with dark pink veins and are shaped like little cups and go all the way up each stem of the plant, blooming each fall with a profusion of color! For your feathered friends, the cardinals LOVE the seeds these bushes produce after flowering. These hibiscus will easily reach a height of 10? in one season and bloom the first year they are planted. You may keep them trimmed back into a hedge or let them grow tall. I suggest trimming them at least a couple of times during they growing season to make them bush out more so you will have more blooms. 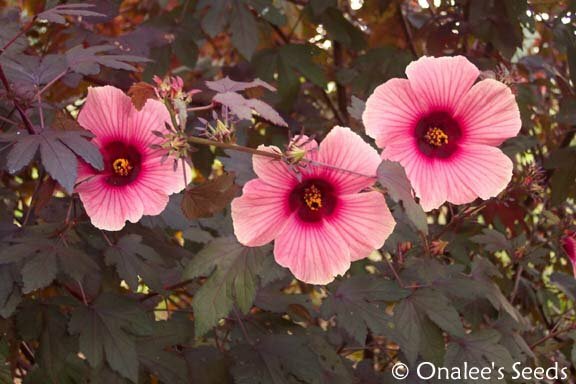 These are a perennial in zones 10-11, (But I suggest growing as an annual in all zones because weak limbs break easily on older plants) a self-sowing annual in other zones. Prefer full sun and sandy soil (but will grow in the shade) ? EXCELLENT plant in drought conditions ? will grow anywhere with very little care! The stems do have small prickers on them, so you may want to keep them away from areas where small children play. 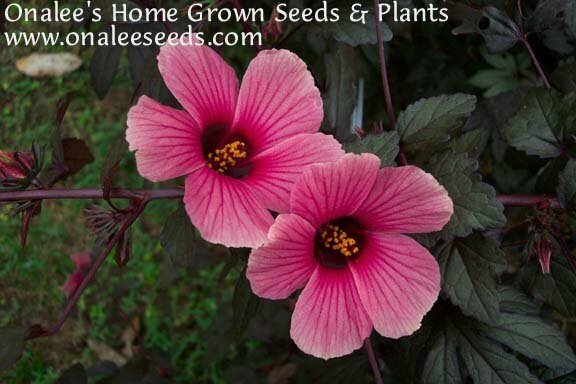 These will be the highlight of your garden and are a definite traffic stopper in the fall with the pink flowers covering the purple bushes top to bottom!